I visited Mexico for the first time in 2001. It was the trip that led me to move to Baja California Sur in 2002. Before I arrived in Baja, however I flew into Puerta Vallarta, on the other side of the Sea of Cortez, and traveled North to San Blas in the state of Nayarit, to a hotel claiming to operate one of Corky Carroll’s surf schools. I use the work “claiming” because upon arrival I discovered there was no surf school and I was on my own. In between surf sessions undertaken on a yellowed surfboard with La Sandia (the watermelon) painted across its ample width, I explored the area around the tiny village San Pancho. 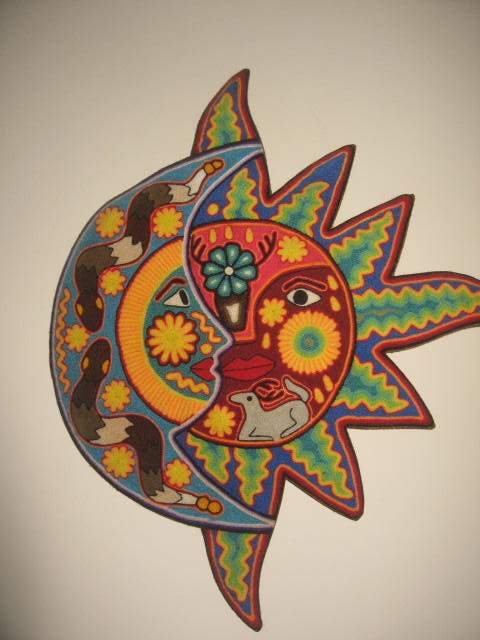 One day, I stumbled across a small art gallery filled with brightly colored tapestries made of yarn and objects covered in brightly colored beads depicting different animals, suns and moons, plant life, and a symbol I was not familiar with that appeared in most pieces. It looked like a flower, with tear-drop shaped petals, but it’s coloring was always green and I sensed that while it may have been a plant, it was not a flower. As I stood looking at the artwork, a gentleman working in the gallery approached me. He was dressed in loosely-fitted white cotton clothing with a brightly-colored woven belt around his waist made of the same material used in some of the tapestries displayed on the gallery’s wall. He had a friendly, round face, dark skin and even darker, deeply-set eyes. He struck up a conversation with me in Spanish and although my knowledge of the language was very rudimentary, I discovered that we were able to make ourselves understood quite well. 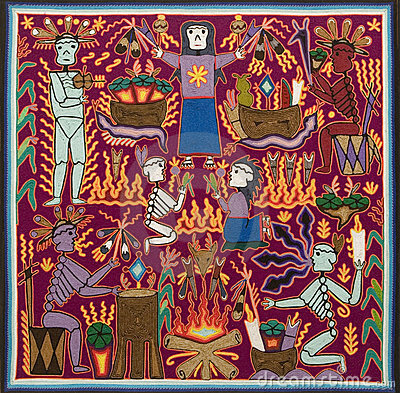 He explained that he was a member of a tribe of native Mexican Indians, the Huichol (‘wee-choll’), who made the unique art that surrounded us, depicting a culture of nature worship. He patiently explained what each of the symbols meant – that the Sun is father and master of the heavens, and the Eagle, Werika, is his wife, mother of the sky and goddess of life; that the deer, Kauyumari, is a spirit guide who leads the shamans on their visionary pathways. The strange symbol that I thought was a plant he explained was peyote, or Hikuri. My ears pricked up. I’d always been curious about this plant and it’s reputation as a hallucinogen and spiritual teacher. I’d read Carlos Castaneda’s The Teachings of Don Juan and was intensely curious about plant-derived psychotropic compounds as a means of evolving spiritually. This despite the fact that I’ve never been much into recreational drug use. As he spoke I felt a slight shiver run through my body. With this we began discussing religion and things of a spiritual nature in general. It was an intense conversation in which I felt a strong level of understanding and connection to the man. I left the gallery feeling energized, buoyed up. I’d just engaged in my first spiritual conversation in Spanish! Later the same day I was struck by the realization that I didn’t speak Spanish well enough to have the kind of conversation we had and again, a shiver ran through me as I wondered if perhaps there hadn’t been some magic involved. One of the pieces I bought. The next day I returned to the gallery to buy a couple of pieces of Huichol art. The man greeted me warmly. He went into the back room of the gallery and returned with something in his hand. He placed a round shell, a little larger than a silver dollar, in my hand onto which the peyote symbol was carefully laid out in tiny beads. I looked down at the tiny symbol. “I remember,” I said feeling my heart swell in my chest. I’m a plant biologist, but there was a time when I wanted to be an anthropological botanist – a scientist who studies the plants used by indigenous cultures for curing illnesses, imbalances, and for spiritual purposes, like the character Sean Connery played in the ’90s movie, Medicine Man. I wanted to, that is, until I realized that almost every indigenous culture in the world is patriarchal and their shamans don’t generally share their knowledge with white chicks like me. When I discovered that the entire Huichol spiritual doctrine is centered around a plant, I felt connected to them somehow. There seemed to be some kind of grace or Divine connection inherent in our meeting, like I was being contacted on some level, told that I was on the right path. That first encounter with the Huichol and peyote left me wanting to know more about them both. I’ve been drawn to them ever since. For whatever reason though, I haven’t had the chance to interact with them much. Once in a very little while I run into someone working in a gallery much like on that first occasion, but my interactions with them have not led to the same level of connection. More than ten years later, in November 2012, that all changed. Find out what happens when I meet a Huichol shaman and his apprentice in Part II: Meeting Hikuri. This entry was posted in Mexico, spirituality and tagged animal, art, Baja California Sur, bead art, cactus, Carlos Castaneda, gift, hikuri, Huichol, Huichol art, indigenous, mysticism, peyote, plant, religion, San Blas, San Francisquito, shaman, Teachings of Don Juan, yarn art by Dawn Pier. Bookmark the permalink. Dawn, what a lovely story. In fact, it gave ME chills just reading about it. Oh, does your blog have a FB page associated with it? Glad you liked it Luanne! And thanks for the feedback. I think you’ll like the next parts as well – that’s when things get REALLY interesting. I don’t have a FB page for my blog actually. Maybe we can discuss the pros and cons? I just did one for mine, so I’ll PM you. Thank you sooo much for your lovely comment!! I can’t believe I didn’t see it until now!! I am working on a memoir that I hope you will enjoy as well!! Your encouragement is just the kind of medicine I need to push forward with the task!! Peace! !